We’re a one of a kind studio, not a chain. An owner-operated, independent business, born of passion, perseverance and deep belief in the quality of our offering. Core values are mindfulness and sustainable movement for your entire life, as it evolves. Classes developed from a lifetime of movement training and passion for sharing it with the local community. World-class instructors that have taught and trained at top-tier studios across the country and around the world. The most beautiful new studio in Portsmouth. A stunning space to practice in - a breath of fresh air. Whether you’re at your peak of fitness and want to take things to a new level - or returning from injury, pregnancy, hiatus from a fitness routine or something else - we respect your journey and will share new ways to evolve, improve and strengthen. barre class is for everyone! our space is soaked in sunshine! BUTI - a yoga dance party! we love beginners! try something new. EVOLVE was created by owner and Portsmouth resident, Jackie Lucas, to support each client’s goals in the areas of fitness, physical and inner strength, resilience and overall wellness. Though life evolves through significant ups, downs and changes - Jackie’s steadfast mission is to introduce clients to practices that are sustainable for life, supporting our highest potential through it all. Jackie has a lifetime of classical ballet training, 12 years of experience in the barre arena and three movement teaching certifications. She is committed to rising above life's obstacles and tapping into mindful movement to develop our best selves. All classes share a common thread of mindfulness practice. EVOLVE classes are an ideal foundation for fitness and wellness. 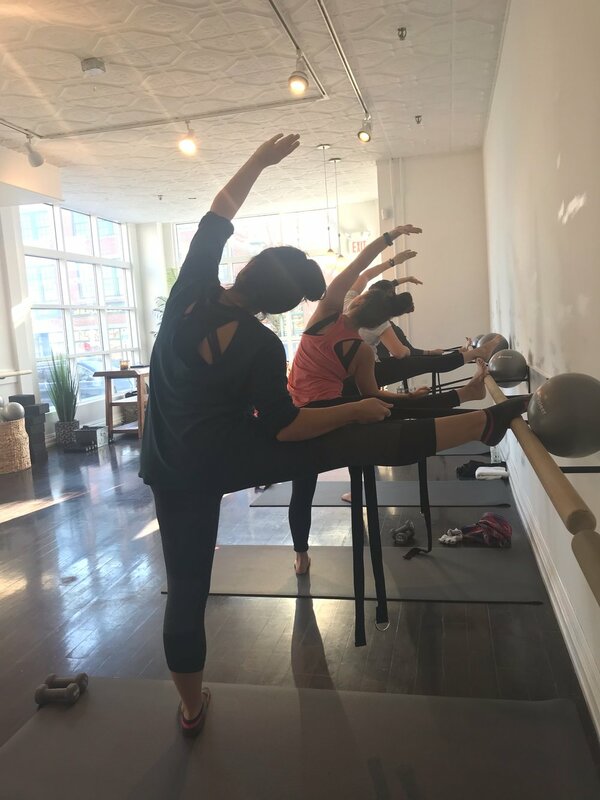 Our barre method integrates ballet conditioning exercises fused with yoga, pilates, orthopedic, calisthenic, isometric and plyometric movements. Our yoga classes range from the high-energy BUTI method exploding with empowerment and energy to vinyasa classes that focuses on form and flow, and restorative yoga. Our varied cardio classes ensure your heart and breath remain a focal-point of your overall fitness. Our brand new studio is drenched in natural light. We provide the highest quality mats & props. Just come and enjoy a variety of fun classes that will challenge you in new ways, and leave you feeling positive and accomplished. Private sessions, and customized group classes available. Let’s create your custom class as part of a bachelorette weekend, a team-building day with your colleagues, or any other idea you have. We look forward to building partnerships with other independently-owned businesses! Let’s connect and help each other thrive.